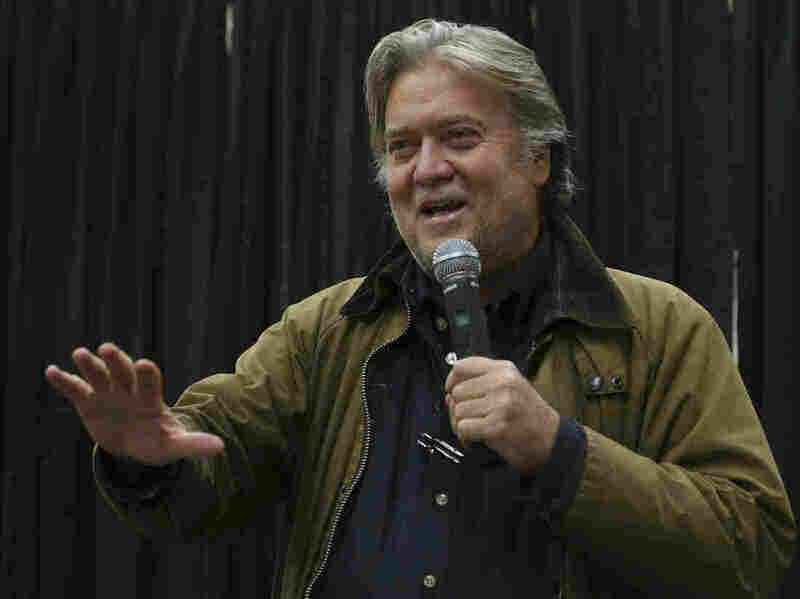 Steve Bannon Documentary Lets Former Chief Trump Aide Make His Case A new documentary provides an unsparing look at former Trump adviser Steve Bannon, including his casual talk of apocalypse and trademark look of dissolution. A new documentary provides an unsparing look at former Trump adviser Steve Bannon, including his casual talk of apocalypse and trademark look of dissolution. In filmmaker Alison Klayman's The Brink, viewers are invited to render the kind of judgment that will not be subject to any presidential pardon power. Klayman's film is nearly two hours of unbridled Bannon with little battening. We are invited to marvel anew at all the hyperbole and dishevelment, the casual talk of apocalypse and the trademark look of dissolution. But we are also shown what some have found charming, even irresistible about the man. We see fans clapping and giggling at the prospect of meeting him. We see him holding forth in living rooms and lodge halls, revving up red-state crowds large and small. This is where we hear Bannon speak of Trump's election as an act of God, recruiting activists by adding that "Divine intervention needs human agency." "I'm gonna get crushed in this film," Bannon wails at one point. "She's gotten every five-star hotel..."
At times he speaks straight to the camera, making pronouncements about the righteous American working-class uprising that ushered Trump into the Oval Office. More often, he is seen gazing out windows into the middle distance, muttering soliloquies — wistful but always self-aware. Does he forget he's on camera? "Steve Bannon is always performing for every person who is in the room," Klayman says. "Even when he's alone." Why do people submit to such invasions of privacy? At a screening in Washington on Tuesday night, Klayman introduced her co-producer, Marie Therese Guirgis, who turns out to have produced, among other things, the cooperation of the film's subject. Guirgis had worked for Bannon during his years as a film producer a decade ago. She liked him; he trusted her. Next thing you knew, Bannon was agreeing to have Klayman quietly present, shooting and recording as he went about his business. Klayman says she made a conscious decision: "I would let him underestimate me and never let myself underestimate him." The real art in such cinema verite is often in the editing, and Klayman (known for her film on Chinese dissident artist Ai Weiwei) has cut this film with drive, perception and purpose. We are with her subject in his highs and lows, great moments, small, manic moods and dark ones. Adding a certain sense of faded luster in the film are the friends and hangers on we see, from a nephew who brings Bannon his Coke or kombucha to Trump sycophant Sam Nunberg ("I got Trump onto Twitter") to the former Goldman Sachs president, John Thornton, who hangs out and encourages Bannon to be the intellectual entrepreneur for the populist-nationalist uprisings of our time. In one remarkably unguarded moment, Bannon rebukes Nunberg for calling Trump a friend. "When you reach [Trump's] level you don't have grundoons for friends," Bannon says, sitting across from Nunberg on a private jet. "Guys like you and Corey [Lewandowski] and [Roger] Stone think you're his friends." In the end the portrait of Bannon, the one-time publisher of Breitbart who ran the final months of Trump's 2016 campaign, is neither empathetic nor sympathetic. It is unsparing with its subject and his evident sadness. We see the Bannon who segued from campaign chief to "chief strategist" in the White House, holding that title for most of 2017. But we also see the Bannon who took the fall for the political disaster following the white supremacist march in Charlottesville, Va.
Trump tried to straddle that crisis by saying there were "good people on both sides." It didn't work, and Bannon was soon a civilian again. Since his banishment from the White House, Bannon has given interviews to journalists and memoirists and sought to find his own space in the world of politics that was redefined by his former boss. He takes great pride in the Trump victory, and he takes his share of credit for it. In fact, he seems semi-obsessed with Trumpian energy and formula that worked in 2016. He shows real depression over the idea of losing the Republican majority in the House in the 2018 midterms. He warns all who will listen in the fall of 2018 that a Democratic majority in the House will control the appropriations process (as they have) and block funding for the border wall (as they have) and potentially move to impeach (which they still might). He is especially fixated on the fate of the wall, which he calls "the key to the whole Trump presidency." When the November 2018 election results come in, Bannon seems discouraged at the prospect that his timetable will now need some adjusting. But it is, he allows, a historical process with an open-ended time frame. "This is a global revolution," he muses. "And I'm just very lucky to be at the vanguard." Being the tip of that spear not only appeals to Bannon but gives him a mission for his post-Trump life. He is building a "global movement" against globalism, no irony intended. And his definition of globalism includes immigration, the European Union, trade deals, multinational peacekeeping missions and all those elitists he calls "the Davos crowd." France's far-right party Front National President Marine Le Pen, right, applauds Bannon after his speech to the party's annual congress, in 2018 in Lille, France. Much of the film depicts Bannon's networking with a ragtag assortment of European Trump wannabes. The more major figures of nationalism and right-wing populism, such as France's Marine Le Pen or Hungary's Viktor Orban, are seen only in stock film clips and stills. 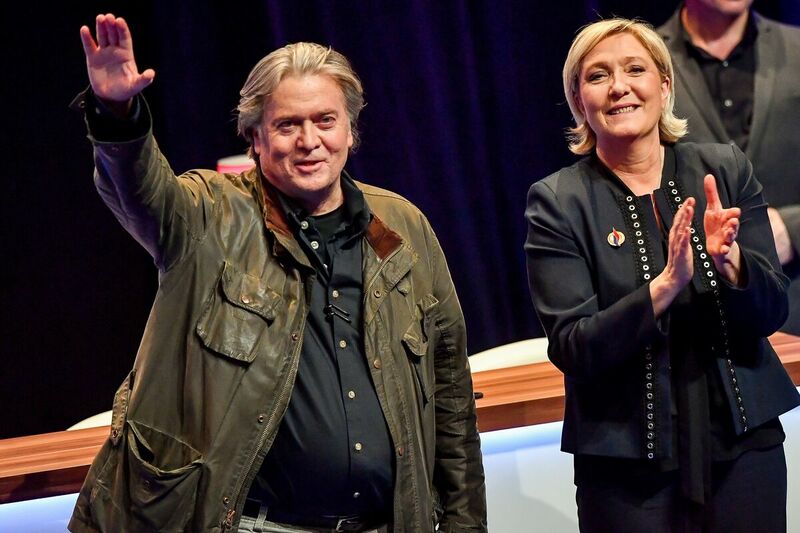 The participants in Bannon's various conclaves are more on the level of Nigel Farage (an impresario of Brexit in Great Britain) and various nativists and right-wing activists from Western Europe. At one point, Bannon kvetches about prototypes for the website and literature of his organization, which he wants to call "The Movement." The designs look cheap, not "classic" enough. He denounces and browbeats his subordinates by cell phone. In the film, Bannon is interviewed by Paul Lewis, a writer for The Guardian. Lewis appeared with Klayman and Guirgis on Tuesday night in Washington, and acknowledged Bannon's claim of intercontinental importance. Nonetheless, Lewis insists, Bannon is simply not a factor in European populism. What Bannon is, Lewis adds, is "very effective at portraying himself as enormously important to that movement." In the end, that may well have been Bannon's intent in cooperating in the making of The Brink. But the story the film tells is ultimately quite different. The film is scheduled for general release on March 29.